You may be familiar with the espionage efforts of female spies like Josephine Baker and Mata Hari, whose lives have been committed time and time again to film. But there are numerous female spies who — even if we don't agree with all their politics — led fascinating lives, ones that could fill entire movie franchises. Honestly, we could populate an entire list with the fascinating women who worked in espionage during World War II on all sides of the war. Among those women was Inayat Khan, the daughter of an Indian Muslim father and an American mother. Khan's father was a pacifist teacher of Sufism, and Khan grew up in France, where she studied child psychology at the Sorbonne and music at the Paris Conservatory. Before the outbreak of the Second World War, her career focused on writing poetry and children's stories. But when the war broke out, Khan and her brother, Vilayat, decided to help the Allied cause, in part to fight the Nazis and in part hoping that distinguishing themselves in the war would help bridge relations between English and Indian peoples. She joined the Women's Auxiliary Air Force and trained as a wireless operator, and was eventually recruited into the F (France) Section of the Special Operations Executive. Although some of her superiors thought she was too soft and gentle to work as a spy, Khan travel to Nazi-occupied Paris, and, after the arrests of several other operators, was, for a time, the only wireless operator still working in Paris, transmitting messages back to London. Sadly, Khan's story has a tragic ending. She was betrayed to the Germans and arrested. Although Khan did not reveal any secrets under interrogation, she made a terrible mistake: she copied the messages she had sent into her notebooks, which the Germans discovered. They were able to successfully impersonate Khan in further messages to London, which resulted in the capture of three of London's operatives. The formerly gentle Khan proved violently resistant in prison, and was classified as "highly dangerous." She was shackled most of the time, and beaten by the officers. She, along with a handful of other SOE officers, were moved to Dachau Concentration Camp, where they were executed. Khan does appear in a few pieces of media, including the television miniseries A Man Called Intrepid, in which she was played by Barbara Hershey. Here's what you need to know about Nancy Wake: she once killed an SS officer with a judo chop to the throat. Born in Wellington in 1912, Wake moved to Sydney as a child, but ran away from home at 16. She initially worked as a nurse, but trained herself as a journalist as she traveled through New York and London. By the time World War II broke out, Wake was working for Hearst newspapers as a European correspondent. Wake saw some of the horrors of the Nazi movement firsthand in her role as a journalist. In Vienna, she witnessed gangs of Nazis beating Jewish men and women at random. So she leaped at the opportunity to join the French Resistance. She worked as a courier, using a bit of flirtatious charm to throw off Gestapo members, and joined an escape network, helping Allied military personnel flee Marseille. Wake became the Gestapo's most wanted person, known as the "White Mouse" for her ability to evade capture. A five million-franc price was placed on her head. Wake eventually fled France herself, crossing into Spain and eventually reaching Britain. Her military career was only just beginning, though. Wake joined the SOE, where she turned out to be a crack shot in training, and was assigned to work in Auvergne. She parachuted into the province and became responsible for organizing weapons and supply drops, and even engaged in combat, leading guerrilla attacks and sabotage missions. On one occasion, her team was spotted by an SS sentry, and she employed a bare-handed combat technique she'd learned in SOE training: that judo-chop to the throat. She said it was the only time she used it, and she was quite surprised when the fellow dropped dead. Wake ended up being one of the most decorated servicewomen by the end of the war, but World War II had a very personal cost: Wake's husband, Henri Edmond Fiocca, did not leave Marseille when Wake did. He was eventually captured by the Gestapo, tortured, and executed. 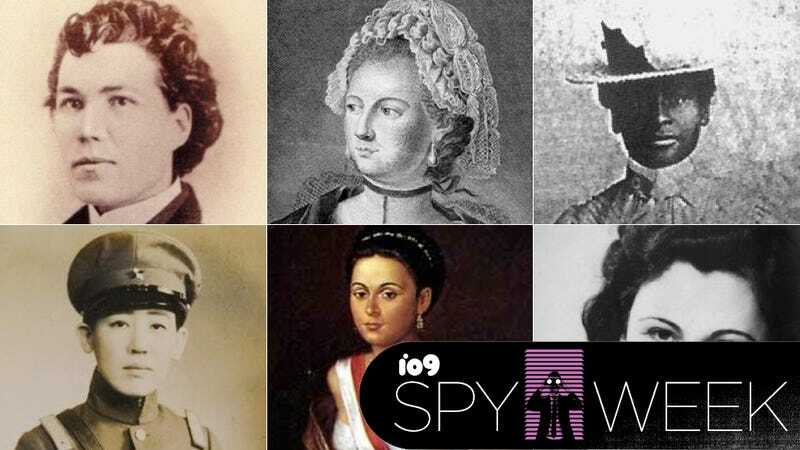 When it comes to American Civil War spies, the Confederate spy Belle Boyd tends to attract a lot of ink, but many black men and women (including Harriet Tubman), risked their lives and liberty to spy for the Union. Mary Bowser was born into slavery in the Van Lew household in Richmond, Virginia. Her mistresses sent her up North to be educated and later arranged for her to join a missionary community in Liberia. Bowser hated Liberia, however, and soon returned to Richmond, where she married. After the death of John Van Lew in 1843, Van Lew's wife, son, and daughter freed all of their slaves, including Mary Bowser. That daughter was Elizabeth "Bet" Van Lew, an abolitionist who would become famous for running a spy ring for the Union during the American Civil War. And Van Lew's best source of intelligence was Mary Bowser. Why? Because Bowser actually worked in the Confederate White House. Bowser was a brilliant woman with a photographic memory, but she posed as a slow-witted, but competent servant in order to infiltrate the household of Jefferson Davis. Because it was assumed that Bowser could neither read nor write, important papers were left out in the open. Bowser read these papers, memorized them, and fed the information to Van Lew's spy network. Toward the end of the war, members of the household did become suspicious of Bowser. She fled the Davis home in 1865, and tried to burn it down on her way out, although she wasn't successful. She survived the war, living to write about and give lectures on her wartime activities. The Chevalier d'Éon is a fascinating figure, even beyond her career as a spy. Born Charles-Geneviève-Louis-Auguste-André-Timothée d'Éon de Beaumont, d'Éon was likely assigned male at birth and lived publicly as a man for the first 49 years of her life. She worked for King Louis XV's Secret du Roi, and, as part of a plot against the Habsburg monarchy, was sent to Russia to meet with Empress Elizabeth. Because only women and children were able to cross into Russia at that time, d'Éon had to dress as a woman, calling herself Lea de Beaumont and serving as Empress Elizabeth's maid of honour. While living in exile in London, d'Éon was subject to rumors about her true gender, and after Louis XV's death, she returned to France and demanded to be recognized as a woman. The court of King Louis XVI agreed to recognize her as a woman, on the condition that she dress as a woman, a condition that included funds for a whole new wardrobe. D'Éon lived out her life as Mademoiselle La chevalière d'Éon de Beaumont. Japanese-controlled state of Manchukuo, working for the Japanese. In the 1930s, she appeared in radio broadcasts and in factual and fictional stories in the news. Of course, a famous spy isn't of much use as a spy, and Kawashima became an outspoken critic of the practices of the Kwantung Army in Manchukuo. Naturally, this caused friction between Kawashima and her employers, and eventually, she faded from the limelight. She didn't end her career as a spy, however. In 1945, she was captured in Peking by Chinese counter-intelligence officers and executed as a traitor by the Nationalist Government. It's not clear how much of this is true history and how much is historical myth born out of a propaganda campaign, but many historians have pointed to the 16th century noblewoman Catherine de' Medici as the leader of her very own spy ring, L'escadron volant, or the Flying Squadron. Supposedly, Catherine recruited beautiful women to form sexual liaisons with powerful men at court, so that they could learn these men's secrets and pass them on to Catherine. Alleged members of this Flying Squadron include Charlotte de Sauve, who was supposed to have spied on François, Duke of Alençon on Catherine's behalf, and Isabelle de Limeuil. The latter bore a son, whom she claimed was fathered by Louis, Prince of Condé. According to historian Mark Strage, Catherine dismissed Isabelle from court, in part because of her failure to be discreet about her affair. Manuela Sáenz is another woman whose entire life is simply fascinating, linked as it is to the Latin American struggle for independence from Spanish rule. Sáenz is perhaps best known as the mistress of the Venezuelan revolutionary Simón Bolívar, but Sáenz was involved in covert politics before she even met Bolívar. In 1819, Sáenz and her husband, English merchant James Thorne, where she became involved in the conspiracy to depose José de la Serna e Hinojosa, the viceroy of Peru. Bolívar became known as El Libertador in his lifetime, but he called Sáenz Libertadora del Libertador, because she helped him escape Bogota in 1828 when mutinous officers attempted to assassinate him. After Bolívar's death in 1830, Sáenz was exiled Colombia and she ended up dying in poverty and obscurity. But during her lifetime, she was an active figure in many of South America's major political shifts. One of the KBG's most valuable spies, Melita Norwood was active starting in the 1930s and didn't retire until 1972, when she was 60 years old. Norwood was British, but she was also a communist sympathizer and decided to spy for the Soviet Union because she wanted to support the country's "new system." Norwood used her job at the British Non-Ferrous Metals Research Association, Norwood passed documents related to the nuclear weapons program — apparently speeding up Soviet nuclear progress. Interestingly, Norwood's husband, the son of Russian parents, was aware of her activities but did not approve. British intelligence became aware of Norwood's role in the Cold War in 1992 after the defection of KBG archivist Vasili Mitrokhin, but it did not become public knowledge until 1999. Norwood received a Soviet pension for her service and was never tried for her spying on her own country. She did, however, become a public object of fascination towards the end of her life, known as the infamous "granny spy." If we can believe her memoirs, Sarah Emma Edmonds was probably the closest thing the Union Army had to a master of disguise during the American Civil War. In fact, Edmonds entered the Civil War in disguise. She enlisted in the 2nd Michigan Infantry dressed as a man, calling herself Franklin Flint Thompson. She served under General McClellan as a field nurse, and, according to her own writings, applied for a won a position as a Union spy. Edmonds claims that she frequently traveled into the Confederacy in disguise — sometimes as a black man or woman — seeking out information and stealing papers from Confederate officers. However, when she contracted malaria, she deserted the army, fearing she would be found out as a woman. She ended up serving out the rest of the war as a nurse once again, but this time in female dress. Marthe Cnockaert wasn't just a World War I spy — she was also a writer of spy novels. In 1915, Cnockaert was working as a nurse in a German military hospital in Roulers, Belgium, when her friend Lucelle Deldonck recruited her as a British intelligence agent. She spied on German military personnel in the course of her work, working alongside other female Belgian spies. But her activities weren't limited to snooping; she also sabotaged a telephone line being used by a priest who was spying for the Germans. In fact, it was a sabotage mission that led to Cnockaert's eventual capture. Sneaking into an abandoned sewer system, Cnockaert placed explosives beneath a German ammunition depot. Unfortunately, she lost her watch, which was engraved with her initials, during the mission. She was arrested and served two years in a prison in Ghent, and was released at the end of the war. She married a British army officer who ghostwrote her memoir, I Was a Spy!, which was adapted into a 1933 film. She went on to publish a slew of spy novels.